Most of us at home maybe using multi-plug to connect all the electronic devices with power cords. You may have even got confused to get the right cord for unplugging it among the other cords that lead to the same outlet. At last you pull one out and hope that it is the right one. This is one of the main problems with electric connections. Though it makes the life of people simpler, it can also cause more clutter in the method. It may not be a big problem for us. But think about the electric stations where hundreds of wires run from the same outlet. For them, it is a problem. As a part of the upgrade in technology and also the above reasons, researchers have started developing methods to transmit electricity to devices wirelessly. Though the method may sound completely new, the basic idea behind this theory was first proposed by Nicola Tesla in the early 1900’s. He was also able to release a prototype by transmitting power to lights that were kept in the ground at his Colorado Springs experiment station. Though the first prototype received wide applause, the method was not practical enough for a higher range of its application. After years of research, many theories about this matter were discussed and some prototypes were also released. Some of them were not recognized while some of them are already in use. The best example for such a device is the electric toothbrush. There are many types of wireless data transferring mediums in this world. Some of the most common ones are infrared, radio waves, bluetooth, and so on. In all these technologies, the signals will be scattered into space before they are received by the corresponding devices. The same method cannot be used for transferring electricity as it is power consuming and dangerous. The main principle that is used in electric toothbrush is called Inductive Coupling. The basic idea is that a magnetic field is induced when an electric current flows through a wire. The magnetic field will be circular in shape and will flow around the wire. When another coil is placed in the same magnetic field, a current will be induced in the wire. This is the same principle that is used in a transformer and also in the electric brush. A magnetic field is created inside the brush through the current that moves through the coil inside the charger. When the brush is connected to the charger, another current will be produced in another coil, due to the magnetic field. This current is supplied to the battery which is the input for the brush. But this method is not practical when it comes to transmitting energy to longer distances. For such a method, it is necessary that the coils are close enough to each other so that the small magnetic field is produced. When it comes to longer distance transmission, a very big magnetic field is to be produced and the coil turnings should be multiple. Counter measures should be taken to save the energy wasted due to the flow of magnetic field in different directions. This is practically impossible. A much better method and its explanation are given below. Some researchers at MIT found a better way to transmit power between coils that are kept a few metres apart. They also claimed to increase the distance between the coils by adding resonance to the equation. Resonance can be defined as the frequency of a device when it vibrates naturally. The resonance of a device greatly depends on the size and shape of it. The frequency is called the resonant frequency. The vibration at resonant frequency can be easily obtained. But vibration at other frequencies is difficult. According to the researchers, when the magnetic fields have the same resonation around the coils, the current will be induced in a different manner. 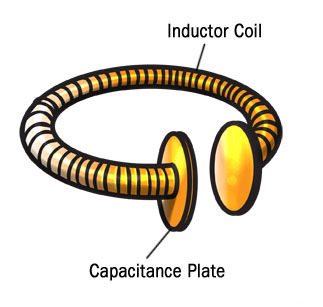 The theory was proved by placing a curved wire coil as an inductor along with a capacitance plate at each end of the coil. This plate is responsible for holding the charge. When current is passed through the coil it starts resonating. The frequency of resonation can be calculated by the equation given below. Apart from the principle in a toothbrush, the electricity will be flowing through an electromagnetic wave and will move from one coil to another, until they have the same resonant frequency. For different resonating frequencies, there will not be any transmission. But transmission is also possible from one transmitter to multiple receivers as long as the former and the latter have the same resonant frequency. The coils being far apart there is no need to worry about the fields around them colliding with each other. Their most successful prototype had a light bulb that was powered from a distance of 2 metres wirelessly. They also formulated some theories regarding wireless electrical transmission through very long distances. It is explained below. The first experiment for long distance wireless power transmission was carried out by the Communications Research Centre in Canada during the year 1980. 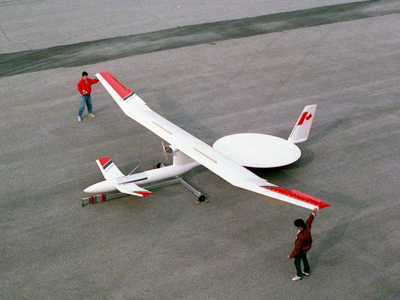 They designed an unmanned plane by the name Stationary High Altitude Relay Platform (SHARP). This plane could not only fly from one point to another, but could also fly in circles at a height if 21 kilometres away from the ground with a radius of 1 kilometre. It was also designed to fly without rest or battery backup for months. The main idea behind the SHARP technology is a large ground-based microwave transmitter. The plane will fly only in the range of the transmitter. The signal from the transmitter will be received by a disc-shaped rectifying antenna called the rectenna, which is placed behind the wings of the plane. This signal will then be converted into DC current. The antenna is usually of the dipole type, that is, it has positive as well as negative poles. When the signal hits the antenna, they will be transferred to a series of diodes. These diodes behave like switches and allow the electrons to flow in unidirection. These electrons are then passed onto the rectenna’s circuitry. The electrons are then shifted to the other parts of the plane.